The ghost of the Galactic Empire, Clan Scholae Palatinae ever stands proud, ready and able, an amalgamation of Dark Jedi and Sith, Gray Jedi and imperial loyalists, mercenaries and bounty hunters. Led by their shrewd Empress, houses Imperium and Excidium come together to form glaive and hammer, together mustering their martial might to secure and expand their territory in the Caperion System and status in the Dark Brotherhood. Clan Scholae Palatinae proudly traces its roots back to Emperor Palpatine’s Galactic Empire. For nearly two decades, the clan maintained an iron grip on its former territory and began to build a formidable military from conscription of the Cocytus natives. The clan fended off attacks from both within, including a terrorist organisation known as 'The Cause' which attempted to restore power to the Cocytus natives, until in 34 ABY, the Dark Council’s Iron Fleet destroyed the Cocytus System, leaving the clan in disarray, forcing key personnel to escape. The clan fled to the Caperion System, a system with diverse spacefaring civilisations and a complex political structure. The clan made its mark on the system by taking Caelestis City from The Meraxis Empire, claiming it as their new headquarters and establishing a new military: the Imperial Scholae Army and Imperial Scholae Navy. The Scholae Empire, modelled on the workings of Palpatine's Galactic Empire, is the frontal governmental system operated by Clan Scholae Palatinae. The Scholae Empire is public knowledge to inhabitants of the Caperion System, while the Dark Jedi clan, the real force behind the government, operates in the shadows. This fact is unknown to all but the top military, economic and political leaders, those who are familiar enough with the Empire to know that disclosing its secrets is unwise. Headquartered in the City of Caelestis, on Ragnath, the Imperial Government is led by the Emperor of the Scholae Empire, who rules de facto over its claimed territory. This territory currently consists of the capital and most of the continent of Maqor. The appointed officers, and below them the Senate, help alleviate some of the duties of the Emperor. Advisors within the Imperial Palace handle the functioning of the realm so that the Emperor has the time to direct and control as he wills. The Emperor of the Scholae Empire and the Consul of Clan Scholae Palatinae form a singular role. While this subjects the system to more frequent changes in Emperor, it is not enough that it causes major alarm for the citizens, who fear the title more than the man himself. The current Emperor of the Scholae Empire is Elincia Rei, who goes by the title of Empress. The appointed officers of The Scholae Empire are hand-picked and answer only to the Emperor. The Proconsul of the Clan also takes the role of Grand Admiral of the Scholae Empire. 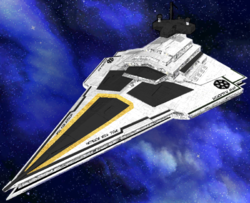 The Grand Admiral is the supreme commander of the Imperial Scholae Army and Imperial Scholae Navy. While there were twelve Grand Admirals in Palpatine’s Galactic Empire, Scholae only employs the one due to its relative small size. The current Grand Admiral is Mune Cinteroph, the master of the current Empress. The Imperator is the Quaestor of House Imperium. The role of the Imperator is to ensure the success of House Imperium in its primary aim of upholding the ideals of the Empire and maintaining security within its territory. Closely aligned with the military, House Imperium are an elite, well funded and well rounded fighting force that mostly operate within clan space. The current Imperator is Shadow Nighthunter. The Executor is the Quaestor of House Excidium. The role of the Executor is to ensure the continued success of House Excidium in its primary aim of executing the Emperor’s will. The role of the Executor is not public knowledge, and their actions, often outright criminal in nature, are officially disassociated with the Emperor. The current Executor is Jorm "The Jester" Na'trej. The Rollmaster of the clan also takes the role of Director of Imperial Intelligence, often shortened to Director. The Director is the leader of Imperial Scholae Intelligence the main intelligence force of the Scholae Empire, responsible for the collection, analysis, and exploitation of information in support of law enforcement, national security, military, and foreign policy objectives. The current Director of Imperial Intelligence is Calindra Hejaran. The Imperial Senate, comprised of Dark Jedi members of Clan Scholae Palatinae and civilian politicians, is an advisory body to the Emperor. Members of the Imperial Senate meet regularly to discuss various matters, which have crucial meaning for the functioning of the Empire. However, the Scholae Empire is not a democracy and The Imperial Senate has no power to make any real decisions. It may provide opinions on certain matters or its own ideas for bills, but they still need to be reviewed and approved by the Emperor himself, and are frequently overruled. Nevertheless, the Senate serves the function of making people think that they have an influence on how the Empire is ruled. Scholae Palatinae is new to the Caperion System, and as a result is still establishing itself as a functional economy in its new home. The Caperion System is home to five different factions all with various cultures and needs, which provides a rich array of options for Scholae to exploit from its super-rich capital, Caelestis City. Imports/Exports: The Scholae Empire has a better understanding of the Galactic economy than its neighbours in Caperion, housing members from all across the Galaxy. As a result, it knows where to find all the best goods. Scholae Palatinae maintains a healthy trade partnership with its neighbours by purchasing luxury items from across the galaxy and selling them on to Elaya, the UCE and Nayama for a profit. Tourism: Caelestis City, was the jewel of the Meraxis Empire, a technological masterpiece, and now belongs to Clan Scholae Palatinae. Once extremely difficult to access for non-Meraxis citizens, Scholae has opened up the city for tourism, reaping monetary benefits from its major landmarks. Internal: The Scholae Empire makes money from within its own territory through a high rate of taxation made possible by the wealth of its capital. Further, Scholae engages in the practices of accepting loans from its wealthy citizens in return for imperial favour. Health Tourism: Tipoca Station is a state-of-the-art hospital in space allowing for up to 80.000 patients to be treated at once. That is more capacity than Scholae Palatinae’s navy crews, ground forces, auxiliaries and Clan members combined could occupy, or not far off. The surplus capacities are privatised and used by citizens of the Scholae Empire and its allies for those who can afford the best healthcare the system has to offer. Clan Scholae Palatinae is the shadowy organisation, mostly of Dark Jedi, that uphold the Empire in secrecy. Their existence is only known to a select few that can be trusted to have the wisdom not to leak confidential information. Led by the Consul, also known as the Emperor, and supported by the Grand Admiral (Proconsul) and the Director of Imperial Intelligence (Rollmaster), Clan Scholae Palatinae is divided into two houses, both equally important arms of the Empire. Imperium enforces Imperial rule within the laws of the Empire, while Excidium operates entirely within the shadows as they perform tasks that the Emperor cannot be publicly associated with. House Excidium is known as wild cards and dubious character, some even outright criminal, but this is exactly what Excidium needs in order to watch over the Scholae Empire. This group uses a wide variety of skills to ensure that the Empire is protected from internal and external threats that the Clan either can’t see or can’t fight due to more delicate reasons, such as political or public image. As a result, it is publicly disassociated from the Clan itself, and while its loyalties may appear to be less than reputable, in reality its fealty is to the Scholae Empire above all else. House Imperium is the public face of Clan Scholae Palatinae and is a shining example of its power and might. As such, Imperium exudes military strength, tactically precise weapons of mass destruction, elite troops, and a prestigious naval presence. Imperium is designed to awe Scholae’s allies and strike fear into its enemies. This is exemplified in combat on the front lines, but also behind enemy lines, where success can be achieved by shrewd interventions, subversions and outright sabotage of enemy targets and assets, before Imperial troops even hit the ground.. When war breaks out, Imperium will be the first to respond. During peace, they prepare the road to conquest, all in the name of the Empire, and its former glory. Members of Imperium will fight boldly, resorting to brute force to overpower the enemy when needed. To the outside world, they are the visible part of the clan, and often are identified as such. Imperium holds several garrisons under its own command, to deter rebellious forces, and to spread the influence of the clan. The military of the Scholae Empire is broken into three elements: the Imperial Scholae Army (ISA), containing the clan's ground forces, the Imperial Scholae Navy (ISN), containing its ships, and the Imperial Scholae Intelligence (ISI), consisting of spies and data analysts. Each branch is highly regarded for their skills in warfare; though, each element is uniquely different in the way it is deployed and managed. As a combined force, they are designated The Military of Scholae Palatinae. Based on Imperial rule and tradition, the divisible elements can be positioned and commanded with greater ease. Presiding as Overlord of the Legions & Clan Fleet is the Emperor’s Right-Hand: The Grand Admiral. This is the highest rank one can attain within the Military, short of being the Emperor himself, and is seen as the Chief Military Expert and Leader within the clan. The clan military operates two ranking systems, one for the navy and one for the army. The army ranks are identical to the loyalist ranks of the Dark Jedi Brotherhood. This provides an equivalence between the Dark Jedi ranks and military ranks. The members of Clan Scholae Palatinae do not have permanent command of specific military units, but can commandeer sub-units of the military for specific purposes in accordance with their rank. For the Army, this begins with commanding fireteams of 3-4 troops at the Journeyman ranks, up to entire regiments at the upper echelon of the Equite ranks. In the Navy, Dark Jedi of the journeymen ranks can take brief command of fighter flights, and command destroyers at the upper Equite ranks. More detail is available in the main pages of the Army and Navy. Mercenary forces will also frequently fight alongside the Imperial Forces. During the Twelfth Great Jedi War, an army of Nayaman Mercenaries were paid to support the ISA in the fight against The Collective. These are not currently employed by the clan following the expiration of their contract. Caelestis City is the capital of Clan Scholae Palatinae. Originally built by their main enemy, The Meraxis Empire, it was captured by Scholae shortly after their arrival into the Caperion System. The city was the jewel of Meraxis until it was taken by Scholae, a sprawling metropolis home to 20 million people, the city is famous for its high tech level in comparison to the rest of the space-faring system. Once a commercial hub of Meraxis, the city is now a central trading point for Scholae Palatinae and its neighbours, and since opening to citizens of Elaya, has become a popular tourist destination. Under Meraxis, the city was given extremely little freedom. As Scholae has presented itself as the lesser of two evils compared with Meraxis to gain the support of the people, citizens enjoy slightly more freedom of movement and speech than they did under their former overlords, which goes a long way to keeping the people happy. However, any pro-Meraxis sentiment is still monitored closely by the Imperial Scholae Intelligence. Massive corporations that once called Caelestis their home have been welcomed into the Scholae Empire as it tries to maintain the thriving economy of the city. The rich and famous who resided in the city have been offered citizenship and political favour in exchange for financial donations to the Empire. The commonfolk typically live in high rise apartment blocks, and benefit from a high standard of living in the city. The major landmarks are the Adoniram Tower, the highest building in the city and the previous pride of The Meraxis Empire, now the offices of Scholae top command, and The Lighthouse, a dueling platform. Once home to quiet fishing villages, the Archipelago was torn apart when Scholae Palatinae took over Caelestis City and then marched on the islands. Most of the fishing communities have been displaced and are hesitant to return to the islands. As a result, due to its natural beauty, the island chain has been repurposed as a tourist destination, with memorials to recognise the Civilian and Military losses during the battle. The Caperion System has a well-established history of sentient inhabitants and space-faring technology, being home to 5 diverse political groups (6 including Scholae Palatinae). The newcomers to the system, Scholae is still making its mark, seeking alliances and room for expanding its territory. Isergess is a volatile terrestrial world, composed primarily of large volcanoes along with rivers and lakes of molten lava. Scientific studies of the shifting surface have led to the conclusion that the planet is comprised of over 120 different tectonic plates, constantly in movement along the planet. Of these only 5 are large enough to maintain a semi-stable presence on the top of all other plates, estimated to have been on the surface for over 100 million years. The rest of the plates vary in age from 60 million to as recent as 5 million years. Ownership of Isergess has been in dispute for many generations by the local population. This dispute has been largely between various corporate entities instead of the major political powers of the planet. While it is rich in many minerals, the ability to easily mine the planet’s resources has been hindered by the planets largely volcanic surface. None of the ruling parties of Seraph have had the resources to invest in building long term mining facilities. Xejtrok - the single moon of Isergess. Totally lifeless, it is most notable due to its unique rupturing approximately 200 million years ago. For reasons unknown, the core of the moon experienced a catastrophic reaction, destroying the tailing side of the moon. Venenum is a hostile terrestrial world with a poisonous atmosphere, composed primarily of rocky mountainous terrain, along with rivers, lakes and oceans of sulphuric acid. The climate of the planet is influenced heavily by its elliptical orbit. For the majority of the planet’s 276 day year, the temperature is a moderate 10 - 30 degrees. However, as the planet approaches Caperion, the orbital speed and temperature increase, causing an evaporation of the oceans as temperatures soar to 120 degrees. As the planet passes the closest point of its orbit, the temperature rapidly falls, leading to a standard month of intense acid rain. Venenum was the first planetary step for the people of the Caperion system. Due to its elliptical orbit, and depending on its relation to the orbit of Seraph it can become the closest orbiting planet. In a rare sign of solidarity between the major political powers of Seraph, Venenum was to be home of a cross-cultural colonization effort. However, underestimating the extreme environmental shifts on the planet, along with the strength of the acid rains as it moves further from Caperion, the colonization effort failed, leading to the deaths of over 25,000 individuals from all political parties of Seraph. Ly'palion - the only major orbiting moon of Venenum. It has no atmosphere and there have been no attempts to establish bases on its surface by the citizens of the Caperion system. Its surface has many beautiful colours, but have no real use besides being pleasing to look at. Seraph is the only planet in the Caperion System ideal for harbouring advanced sentient life. Perfect for life to flourish, Seraph contains a variety of terrains, including desert, mountains, plains, jungles and icy polar regions, as well as large oceans of fresh water and a breathable atmosphere and almost standard levels of gravity. Temperatures on Seraph range from 0 to 30 degrees Celsius, depending on latitude and season, with a year length of 450 standard days. Seraph has a variety of animal and plant life forms, including its own indigenous species and those more commonly seen across the galaxy that have been brought in from off world. The planet is home to five major political groups that fight over power, and is heavily populated with cities, towns and villages, home to 3.7 billion people, 80% of which are human. The Meraxis Empire and the Democratic Republic of Elaya possess the largest territory, with the Republic being the main thing stopping the Empire from dominating the rest of the planet. The United Corporations of Elaya are a hugely rich independent faction occupying a single city and possess the majority of the wealth in the system. The remaining two factions are the Nayama Dynasty, a culture renowned for martial arts and craftsmanship, and The Republic of the Force, a theocracy that worship the Force and those who control it. Ragnath - Seraph's only moon, is much like its planet in that, other than its low gravity, is perfect for sustaining life. Ragnath's surface is approximately 57% ocean. Its landmass, which holds 300 million people across several cities, is split into numerous continents ranging in size. While the natural gravity of the planet is very low, artificial gravity generators (the same technology used on capital ships) is used to provide pockets of gravity to major towns and cities. This technology is provided by the United Corporations of Elaya. The 5 political groups of Seraph also occupy territory on Ragnath, with similar relations as on the planet. In addition, Scholae Palatinae have chosen the moon as their home, taking the largest city, Caelestis, from the Meraxis Empire and claiming it as their capital. Albicosus’ surface is largely covered in sheets of ice and glaciers. Its rocky surface does periodically cut to the surface in sharply carved mountain peaks, or in the basins and crags in of the ice sheets. The rocky tectonic plates have rarely shown any movement, but the ice that covers them frequently slides across the plates, resulting in far more movement than seen on the surfaces of other planets. This can result in frequent avalanches on the planets’ sharp mountainsides. Able-bodied and dedicated martial artists from Nayama ventured to the high gravity planet to train their bodies to be strong, and to endure in extreme environments. To make a living they hired themselves out as honorable mercenaries, primarily employed to police Ulress and maintain the peace between the rival gangs that call it home. Unwilling to subject their families to the dangers of the moon, the Nayaman mercenaries took up camp in the old colony of the planet as a permanent base of operations. Shuttles between the planet surface and Ulress go continually as goods and people are moved to and fro. Ulress - The surface of the moon is simple, rocky and icy. The moon held many great valuable minerals however, leading to centuries of mining on the moon. Over time the entire interior core of the moon was hollowed out, leaving a massive shell. The mining of Ulress goes back centuries, with civilians moving to a small mining colony on the planet, Albicosus, and then traveling back and forth to proceed with mining operations. The moon was rich with natural resources, and all the different political parties on Seraph desired to harvest what they could from the moon. When the interior of the moon had been wiped bare, the civilians abandoned the hollow moon and the mining colony on Albicosus. It didn’t take long for the city, officially named Ulr Uvi, to become an outlier in the system. The corporations that led to its creation let control of the city slide into hands criminals and gangs. Commonly referred to as the Black Core, security of the moon was left to hired help from the Nayama Dynasty, who took up residence in the abandoned mining colony on Albicosus. House Excidium, the shady arm of Scholae Palatinae, have taken an interest in Ulress, and see it as the perfect home for a house of their specialities. The nature of the core of the planet Myryakur completely unknown. Its gases are thick and heavy. Particles suspended in the gases are charged in the planet’s rapid rotation and the gases stormy movements. These charged particles have left the planet in a perpetual lightning storm. The thick gas however masks the lightning from orbit and beyond, only noticeable once you break the outermost layer of gas. There have been multiple attempts at better studying the gas giant by the citizens of the system. Early probes faced issues with the planet’s high gravity and lightning storms, rendering most of the data they gathered unobtainable. Later ventures by some of the corporations of Seraph to establish high altitude cities have also ended in failure. Korgollo - Korgollo Major and Minor are the two orbiting moons of the gas giant Myryakur. They are always paired together because they orbit around Myryakur together. As the moons orbit the planet, they also orbit around the center of mass between the two of them. This paired orbit has led to the locals of the system referring to them as the Dancers. Balaerion is a freezing cold terrestrial world of barren frozen wastes. The surface is 96% nitrogen ice with traces of methane and carbon monoxide. Beneath the surface of frozen nitrogen is a thick layer of water ice. The crust is composed of two tectonic plates, bordered on a great circle perpendicular to the equator. Frequent earthquakes along this line have been known to shatter the surface down to the crust. Within the crust lie valuable resources essential for artificial gravity generators and electronics. Life on Balerion dates back a mere thirty standard years, when the Meraxis Empire established the Balaerian Detention Centre, a maximum security prison facility. Largely used as a place to send political prisoners who have spoken out against the oppressive totalitarian regime, the facility is used for mining the valuable resources beneath the ice layer, its prisoners sent there on a life sentence of hard labour. The total planetary population is 100,000, of which 90,000 are miners and the remaining 10,000 are security personnel. Scholae Palatinae ruled over the entire Cocytus System until it was destroyed by the Iron Fleet of Darth Pravus and the clan fled to the Caperion System to establish a new home. Its natives were largely primitive and tribal and bent to the wishes of the Empire's superior technology and Force Powers. While the Empire swiftly took control of the 6-planet system shortly after the Exodus, they faced numerous uprisings throughout their rule from the capital world of Judecca. Now, the surface of its 6 planets are a smoking ruin, the ghost of the civilisation left behind, marked hazardous with strong risk of radiation poisoning. Due to the Imperial nature of the Clan, it is not surprising that it is largely focused on improving itself and expanding its borders, knowledge and prowess. Thus, the borders of Scholae Palatinae have been less open than others due to the Clan’s natural isolation from outside influence. At present, the clan has just recently set foot in the Caperion System and begun to establish territory on the moon of Ragnath. Due to the complex political structure on Caperion and of the Dark Brotherhood, the clan has numerous domestic threats and those further afield. Its current primary goal is to expand its territory, which is currently restricted to one city, albeit the technological masterpiece of Caelestis, on Seraph's moon, Ragnath, taken forcibly from Meraxis. Scholae Palatinae will slowly and patiently expand under the same principles as Emperor Palpatine expanded his power across the Galaxy, unafraid to forge false alliances and break them when the time is right. The Democratic Republic of Elaya - An unlikely ally due to the opposing political views between democracy and imperialism, Scholae Palatinae assisted Elaya in its war against the Meraxis Empire, presenting itself as the best way to turn the tides in the war. The two maintain an uneasy alliance, as Elaya appreciates Scholae's support against its long-term enemy Meraxis, but are uncomfortable with another Empire gaining power in the system. Elaya possesses a military strength comparable to Clan Scholae Palatinae but vastly superior territory. The alliance is on shaky ground following Elaya unexpectedly taking territory from Meraxis. The United Corporations of Elaya - A supremely rich and wealthy city state, they put credits above anything else. What their territory lacks in surface area, their control of most of the wealth in the system makes them make up for this, making them extremely powerful politically. Their highest profits are currently obtained via an arms deal with the Meraxis Empire. The Empress has tried to establish a trade deal with the UCE, but has been unable to convince them that Scholae is a stable trade partner. The Republic of the Force - A relatively poor theocracy under constant threat of invasion from The Meraxis Empire, the TRF believe in the power of the Force and those who wield it. They have a very weak military and rely on the strength of the Republic of Elaya to keep safe. House Excidium have begun to try to subvert the population by using the Force to help refugees displaced by Meraxis' invasion attempt. The Nayama Dynasty - The Nayama Dynasty harbours a culture valuing skill in the arts - both creative and martial. Their Queen is intrigued by the combat prowess of members of Scholae Palatinae, and has hosted the Imperium summit as they sought to make a positive impression on the royal family. While no formal military alliance has been organised, there is a sense of mutual intrigue and potential for cooperation. While their military strength is mediocre, the widespread combat skills of its people act as a force multiplier in a similar way to Scholae Palatinae's Dark Jedi. The Nayaman Mercenaries - A mercenary group training in the cold high gravity world of Albicosus, the Nayaman Mercenaries joined the Imperial Scholae Army during the Twelfth Great Jedi War and fought against The Collective. While their contract has finished, they would be happy to serve Scholae again if their price is met. However, they would be equally happy to serve their enemies if the price was right. The Meraxis Empire - Ruled by an ambitious tyrant focused on conquering the whole of the Caperion System by squashing all in its way, the Meraxis Empire will never accept Scholae's presence in the system as anything other than an insult, especially after they have taken the side of Elaya. 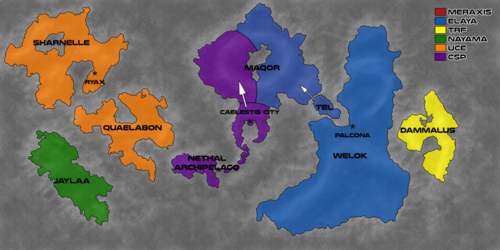 Further, Scholae's only territory in the Caperion System, Caelestis city, was previously the jewel of the Meraxis Empire, and a combined Scholae / Elaya offensive pushed Meraxis off the moon entirely. Meraxis has allied itself with The Collective on the basis that they both hate Scholae equally as much. Meraxis is similar to Elaya in its military power and territory. While the clan can count on the support of the other clans against a greater enemy such as The Collective, it currently has no full time allies. Clan Plagueis - At one point in the distant past, Scholae Palatinae was aligned with the Clans of Satal Keto and Exar Kun. However when these two units fused into a vastly different Clan, Plagueis, a chasm was birthed between the two groups. Clan Naga Sadow - A once strong alliance was shattered by Scholae Palatinae's betrayal of Naga Sadow and the theft of valuable artefacts from the Red Fury Pirates, most notably the aptly named Shattering. However, as recent as this feud was, the events of the Twelfth Great Jedi war put the clans back on the same side, and the future is uncertain. Clan Arcona - In the past, Arcona was the sworn enemy of Scholae Palatinae. This stemmed from the time when Scholae Palatinae was forced to serve as a unit of Arcona. Even after years of separation this tension continued. However thanks to the dulling power of time, and the focus of enemies like the Collective, these feelings have finally faded. While in a state of half-truce, it remains to be seen if this peace will last. Clan Taldryan - Taldryan was historically the dominant clan in the brotherhood, and Scholae Palatinae always had its eyes on taking them down, but out of respect and not hostility. While Taldryan no longer enjoys such a dominant position, with the dominant clans in the brotherhood being Arcona and Odan Urr, the clans maintain a mutual respect and have no significant history of conflict or formal alliance. Dark Council - While Clan Scholae Palatinae are extremely bitter about the destruction of the Cocytus System at the hands of Darth Pravus, Clan Scholae Palatinae nonetheless belong to the Dark Brotherhood, and does not possess the resources for war with the Dark Council's Iron fleet. They grudgingly supported the council in the fight against The Collective. The Collective - The Collective were Scholae's enemy during the Twelfth Great Jedi War. Scholae suffered heavy losses fighting this powerful organisation that hates Force users of both sides and seeks their utter eradication, inspiring the entire Dark Brotherhood to units its forces against them. They have lent support to the Meraxis Empire in its fight against Scholae. Clan Odan-Urr - The Imperial nature of the Royal Clan immediately soured relations with this Light Side oriented Clan. Both have made it clear through passive-aggressive means, that if given a chance they would gladly clash with each other, however, their only interaction was on the same side as they fought against The Collective in the Twelfth Great Jedi War. Loyal to the ideals of the Empire, any threat to its stability begins the gears of war turning. Historically aggressive, they’ve been known to go to any lengths to defend the empire. Loyal, headstrong, these traits often led to trouble for the Imperial Clan on more than a few occasions/ The overly aggressive nature has been tempered over the years, with increased emphasis upon rational and thought out approaches to what serves the Clan best. Being it combat or diplomacy. In the scope of the larger Brotherhood, they are more likely to wait out the situation and analyze from afar. Only when they are certain of a course of action will they visit the full breadth of their might upon the enemy. Nothing is haphazard. Known to isolate itself, Scholae Palatinae has a long history of closing its borders to outside influences at the first sign of trouble - internal or external - and take actions to best serve the Clan. During times of stability, the Clan has become far more open to the rest of the Brotherhood and has even begun to understand the value in garnering allies. They are however not to be crossed or the brunt of their wrath will find itself set upon they who dare betray the Imperial Clan. These are the former and current leaders, or any influential member who is associated with the Clan. Individuals are delegated to one of these prestigious groups; however their reach, most likely, extends into one or more of these classes. This page was last modified on 28 February 2019, at 22:19.